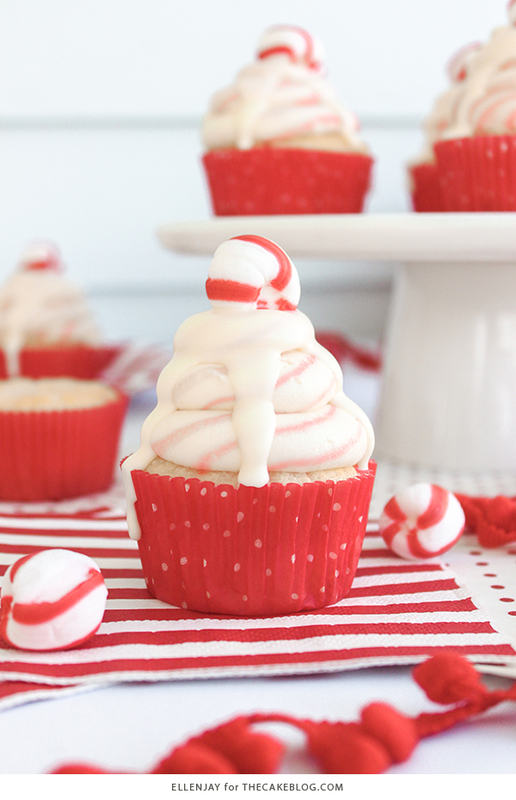 White Chocolate Peppermint Cupcakes – delicious white cake speckled with candy canes, topped with red and white swirled buttercream and white chocolate ganache. 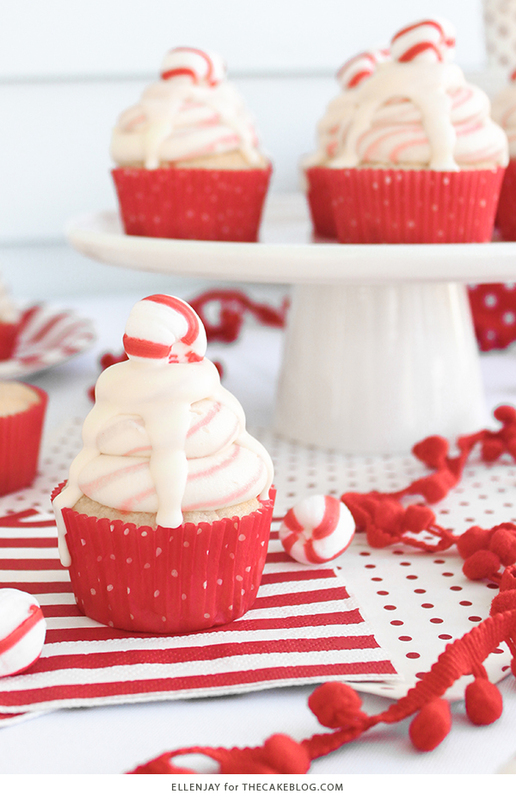 A new holiday cupcake recipe by our contributors, ellenJAY. The moment the candy canes stare you in the face when you enter the grocery store, you know the hustle and bustle of the holiday season has begun and it’s time to start the holiday baking! 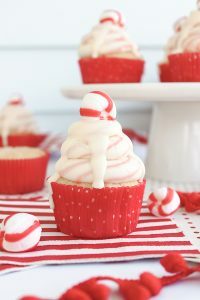 So throw a few boxes of those red and white candies in your shopping cart the next time you’re restocking your baking supplies and you’ll be all set to whip up a batch of these White Chocolate Peppermint Cupcakes. 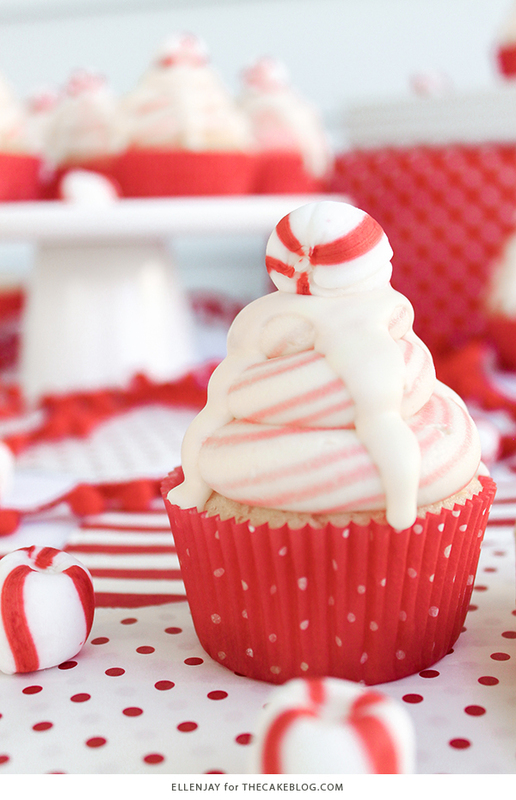 These sophisticated swirled cupcakes are sure to be a show stopper at this year’s holiday festivities. Not to mention they will leave you with the freshest breath around! A delicious white cake is speckled with crushed candy canes and decorated with a perfect red and white swirl of white chocolate buttercream. 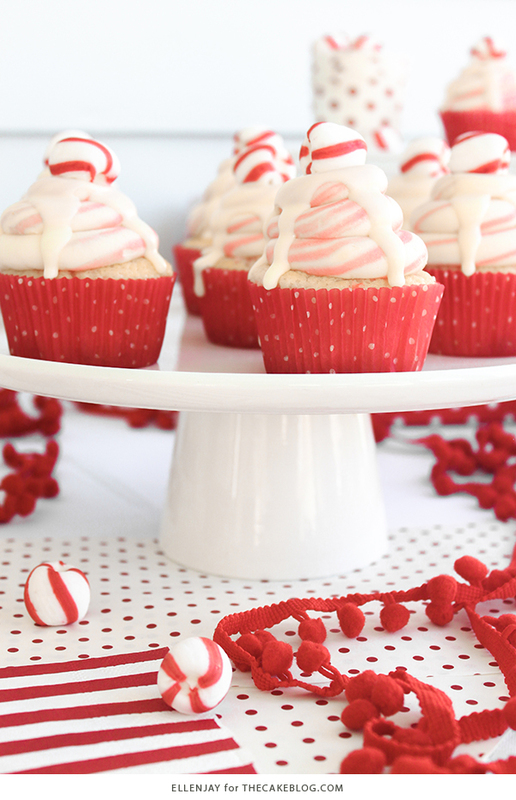 Topped off with a white chocolate ganache drizzle and soft peppermint candy, these cupcakes scream with holiday cheer! If you’re a fan of peppermint bark then you already know that white chocolate and peppermint are a perfect match for each other, and that’s all the more reason you need to give this recipe a try! These cupcakes are the perfect treat to enjoy with your girl friends while watching Christmas movies, take to the office holiday party or to leave for the big guy in red on Christmas Eve! Delicious white cake speckled with candy canes, topped with red and white swirled buttercream and white chocolate ganache. Combine milk and peppermint extract, and set aside. Combine dry ingredients: cake flour, sugar, baking powder, and salt in bowl of stand mixer and mix on low for 2-3 minutes. Add butter a few cubes at a time and mix on low until mixture resembles coarse sand. Add egg whites and beat on medium speed until combined. Gradually add milk mixture and beat for 1-2 minutes until batter is smooth. Bake for 16-18 minutes, or until toothpick inserted comes out with a few crumbs. Allow cupcakes to cool in pans for 5 minutes, then remove to wire racks to finish cooling. Cream butter, vegetable shortening and vanilla in bowl of stand mixer on medium speed for 2 minutes, until smooth. Reduce mixer speed to low, and slowly add in confectioners’ sugar 1 cup at a time while mixer is running. Once all the confectioners’ sugar is incorporated, add the milk and mix for 30 seconds. Melt white chocolate in microwave for 30-second intervals, stirring after each until melted. Incorporate melted chocolate into buttercream and mix until fluffy. Reserve ¼ cup buttercream and add a small amount of red color gel to tint. Prepare a small piping bag with the red buttercream and snip the tip off. Prepare a larger piping bag fitted with a large round tip. Streak the inside of the large piping bag with six stripes of red buttercream. Fill the rest of the bag with the White Chocolate Buttercream. Squeeze a swirled dollop of buttercream on top of each cupcake. Place cupcakes in the fridge to chill while preparing the ganache. Combine cream and white chocolate in microwave safe bowl and heat on 30- second intervals, stirring in between for about 1 minute. Stir until chocolate melts, allow to cool & thicken slightly for about 5 minutes. Transfer to a squeeze bottle and drizzle ganache over top of buttercream. 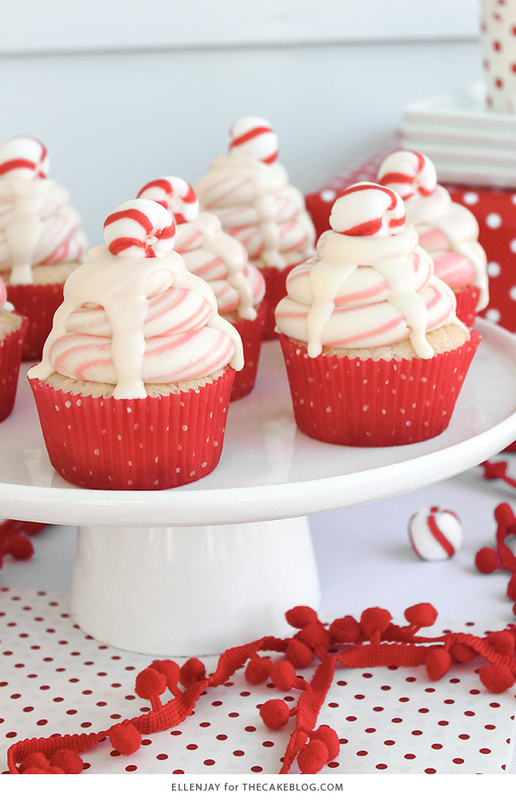 Garnish each cupcake with a peppermint candy. Lauren and Jennifer are the owners of ellenJAY, a boutique bakery in Mobile, AL. specializing in hand-piped sugar cookies and towering cakes with impeccable attention to detail. Read more about ellenJAY on their bio page. These are absolutely beautiful and stunning. White chocolate and peppermint are great together!